Let’s do a quiz! Sailor speciality: Solve the problem. 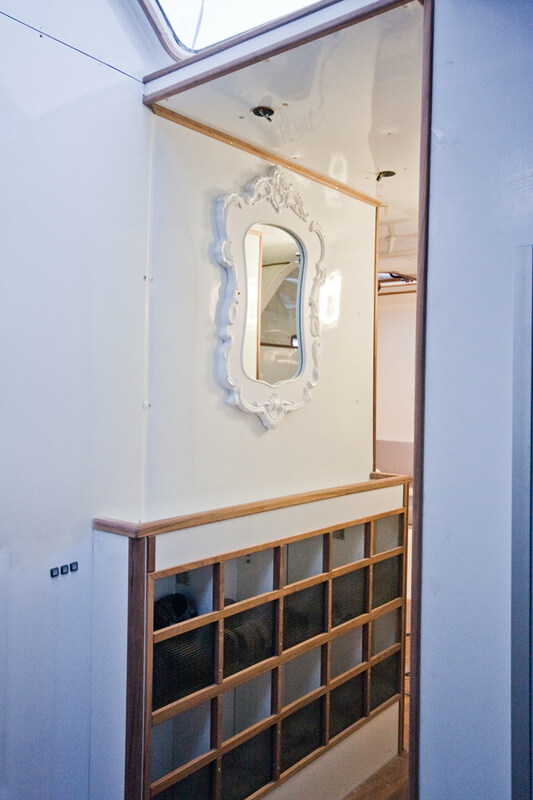 Here’s the answer to last post’s quiz: Right as you descend from the deck-house, just outside the main bathroom, I have placed a wall of small storage compartments where each crew member will have his/her own. For gloves, glasses and other small items you usually find floating around the boat. I wanted a mirror on top of this shelf where crew members could check out their gear, and the more vain can check out their looks. Since I have been looking for some crazy detail to offset the clean space-ship looks of the interior, this mirror became the perfect detail. Love it or hate it ;-) ! Not crazy at all! Nice touch.